With high speed internet connectivity, freelancers have urged the government to extend its support find out high skilled works for increasing their earning from global online outsourcing markets. "Many freelancers are earning handsome amount of money... But we need high speed connectivity to increase income," Elija Begum, a successful freelancer of Keraniganj upazila, told a discussion on "Online outsourcing" here. "Normally we are getting low-skilled works like data entry at international outsourcing markets, which is basically less-paid job. We need high paid works for enhancing our earnings," she shared her experiences while talking to BSS. Alongside providing trainings facilities and expanding internet connectivity, the government should facilitate better market access for online freelancers to raise their income, other promising freelancers told the news agency. Thengamara Mohila Sabuj Sangha (TMSS), a non-government organization, organized the discussion. State Minister for Power, Energy and Mineral Resources Nasrul Hamid Bipu addressed the discussion as the chief guest with Deputy Commissioner of Dhaka Md Salah Uddin in the chair. TMSS Executive Director Prof Dr Hosne Ara Begum, Keraniganj Upazila Chairman Shahin Ahmed and Keraniganj Upazila Nirbahi Officer Abul Bashar Mohammed Fakhruzzaman, freelancers and IT experts, among others, addressed the discussion. Director of Information and Communication Technology (ICT) of TMSS Nigar Sultana made a presentation at the meeting. Bipu said massive digitization is taking place in every sphere of the public sectors, which is eventually fostering economic growth in the country. ICT-based services will significantly reduce corruption and other unfair practices, he said the people particularly rural folks are enjoying the benefit of digitization in public services. Bangladesh has already been recognized as one of the leading outsourcing destinations by various world renowned IT organizations and it should take necessary initiatives to turn the large number of young population into skilled manpower on online outsourcing, the state minister added. "We have to develop ICT infrastructure for high speed internet connectivity. 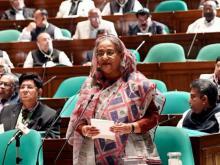 I hope better internet connectivity will further help expand online outsourcing markets in Bangladesh," he added. Prior to the discussion, the state minister inaugurated TMSS ICT Incubator and Innovation Centre at Muktijoddhya Complex, Keraniganj. Highlighting various prospects of ICT sector in major development sectors, Nigar said womenfolk are being empowered with blessing of ICT and they are now making contribution economically at their family and as well as at different spheres of society.